This is how I wrap, pack and ship glasses. It's probably not the perfect way but I haven't lost one yet, touch wood. The first thing I do is wrap the glass in a tissue. A soft paper towel is a suitable alternative and it doesn't leave as much lint on the glass. But the basic idea is to protect the glass from whatever is stuck to the next layer. In the case of crumpled newspaper, this would be newsprint, in the case of bubble wrap, it would be dust and grit. 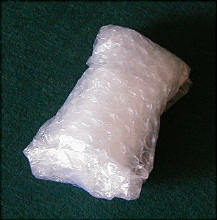 I receive many shots in the mail so I always have lots of bubble wrap on hand. 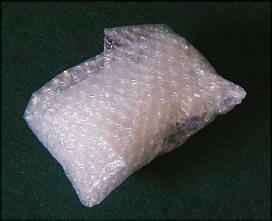 Although recycling the bubble wrap makes me feel virtuous, it's plastic so it tends to attract small particles that potentially could scratch the glass and scuff the label. 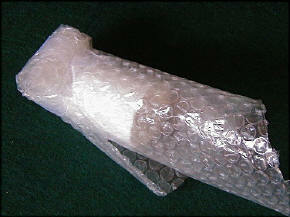 Step 2 is to wrap the glass in a layer of bubble wrap. A 12" by 12" piece is ideal. Place the glass in one corner than roll diagonally to create a tube as shown at right. Tape it securely. Taping is the most crucial part of the process because it ensures that the glass can't slip free of the wrapper and then roam around in the box. This is particularly important when mailing two or more glasses in the same box. Now loosely roll the tube. Begin with the end below the base of the glass and roll toward the base. Tape securely. 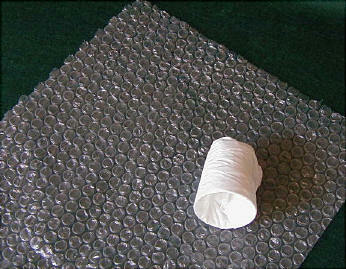 This roll of bubble wrap provides a cushion that will protect the glass against force applied from the base. 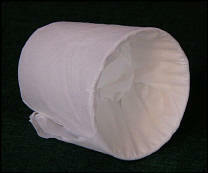 Do the same with the other end, forming a loose roll that will protect the rim. Tape securely. The rim is the most vulnerable part of the glass, so make sure that there's enough of a cushion to protect the rim from damage, even if you were to drop it on a concrete floor right now. 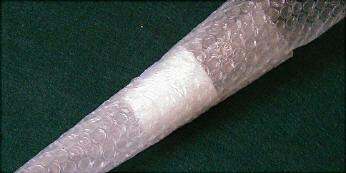 Take a second piece of bubble wrap about 12" x 12" in size and roll the package in it to create a 12" long tube. Tape securely. Fold the two ends over toward the middle and again tape securely. Some people will now wrap the package in copious amounts of 2" plastic box tape until it ends up looking like an ancient glass mummy. There's really no need and it makes the package it so difficult to open that there's a real danger of the recipient damaging the glass inside in an attempt to extract it. Either the glass gets scratched with a box knife or point of a pair of scissors in attempt to crack the plastic wall, or the glass pops clean out of the wrappings while wrestling with the tape. Next, find a box about 6" x 6" x 6" in size. USPS Priority boxes are ideal and they are exceptionally sturdy. They are also free for the asking, but most of you will have an ample supply of used ones lying around. If you want to send the glass by First Class mail rather than Priority, pry a recycled USPS Priority box apart at the glued seam, invert it, and then re-glue (a hot-glue gun works well for this) and tape at the seam. Step 6. The size of the box is crucial. You have to allow enough clearance on all side of the glass to allow the box to crumple and still not put significant pressure on the glass. Go back and look at the photos on the previous page if you have any doubts on this one. 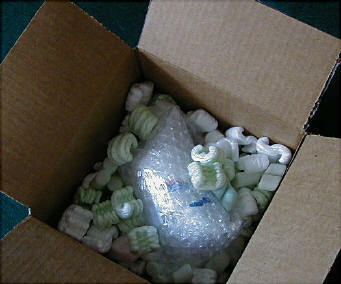 Nest the packaged glass in the center of the box and surround with Styrofoam peanuts or equivalent. Close and tape the box securely along all of the seams. The tape significantly strengthens the box and makes it able to withstand far greater crush forces than it would otherwise. That's really all there is to it. You can safely ship 3 glasses in one of these boxes if they're individually wrapped in the way shown. Good luck! Copyright ©2002-2009 pre-pro.com. All rights reserved.